For Indian designer Sanket Avlani, the tens of thousands of taxis that hurtle through the streets of Mumbai every day are more than a convenient mode of transport; they're a roving platform the city's talent. 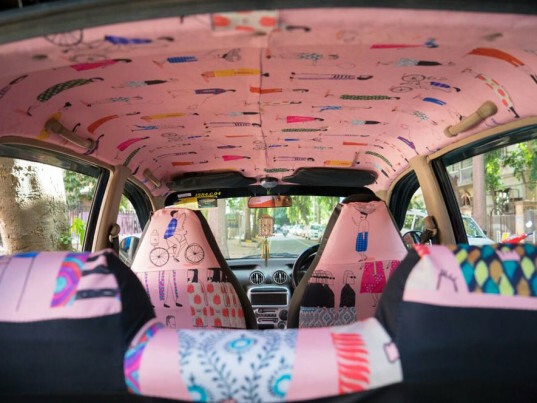 Avlani is the founder of Taxi Fabric, an initiative to reupholster the vehicles' "functional and forgettable" interiors with textiles showcasing the work of local designers, illustrators, and artists. "Design can often be taken for granted in India," Avlani wrote on a campaign page on Kickstarter, where he successfully raised the £17,390 he needed to expand the project. By turning seat covers into canvases, Avlani hopes to not only increase the visibility of young Indian designers but also connect with members of the public through visual storytelling. So far, Taxi Fabric has outfitted six taxis. The success of its fundraising, however, means Avlani and company will be able to reupholster another 30, not to mention compensate drivers for taking their vehicles off the street for stripping and refitting. At a rate of one refitted taxi per week, Avlani predicts an audience of at least 120,000 Mumbaikars by Christmas. "It's believed that older generations don't understand it or recognize it as a proper profession or something worth studying; design to them, just performs a function," he added. "They don't realize that it can create an impact. And with so few spaces for designers to show off their skills, it's hard to change that perception." So far, Taxi Fabric has outfitted six taxis. The success of its fundraising, however, means Avlani and company will be able to reupholster another 30. Besides the cost of printing, stitching, and fitting the fabrics, Taxi Fabrics also has to compensate the drivers for taking their vehicles off the street for stripping and refitting. Drivers are given the makeovers for free. Still, the project can already claim success. 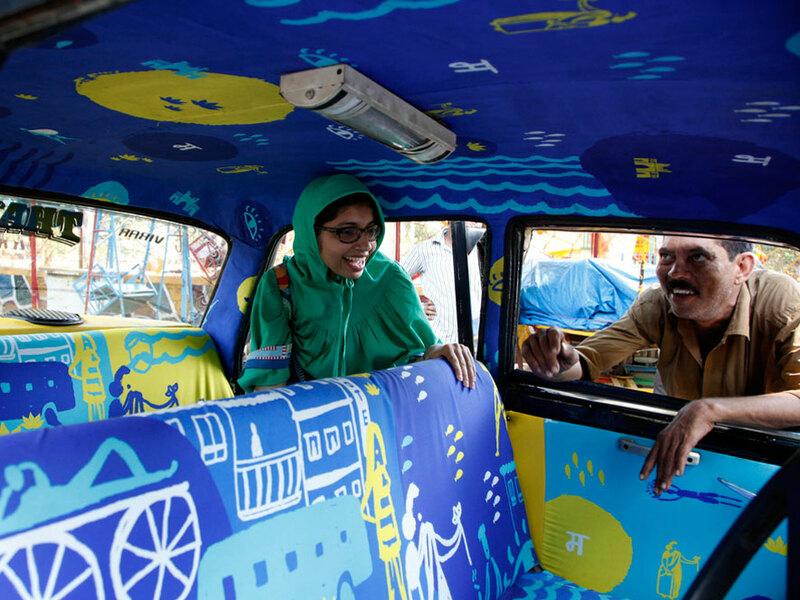 "The taxi drivers have commented that they believe their customers are not only engaging with them more, but most of them also ask them about their designs featured in their taxis," Avlani said. "Some have even told us that they are getting more fares because their taxis stand out in a way the other taxis don't." Taxi Fabric welcomes submissions from artists of every stripe. Its one condition? The design has to be inspired by Mumbai. Designers in Taxi Fabric's stable include Kunel Gaur, Samya Arif, and Pranita Kocharekar. Watch Taxi Fabric's progress at www.taxifabric.org.